But there is a certain joy in waiting. Of quieting your heart in expectation of what is to come. To me, that’s what the season between Thanksgiving and Christmas is, quiet expectation. Expectation reflected in the manger scene by our front door—Mary and Joseph near an empty cradle, waiting. That expectation is also reflected by the pile of books under our Christmas tree. It waits for dinner to be done, dishes to be cleared, hot cocoa to be marshmallowed, and the fire to be crackling. Then the children gather around Daddy and he reads one story each night between Thanksgiving and Christmas. If you haven’t yet discovered Deborah Underwood, you’re in for a treat. Her characters are gentle natured woodland animals getting ready for Christmas, but without the hustle and bustle of other books. 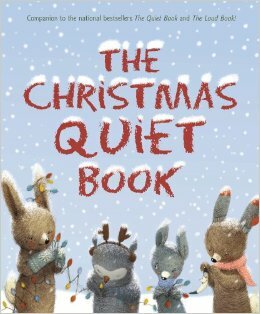 Gorgeously illustrated story about a boy hearing the Christmas story for the first time. Another sweet book. A little tree wishes to be part of something—anything—and winds up being part of something he never could have imagined. How about you? Which Christmas books make your family’s must-read list? When my son, Christopher, was little we used to take frequent walks. Or, more accurately, I would take walks and Christopher would ride along—first in a snuggly (think papoose), then stroller, then wagon. I chose the destination, the route, and the purpose of the trip. Often, our trip was designed to be educational in some way: To the pond to capture tadpoles or to the weeping willow to picnic and read. But eventually Christopher grew less and less content in the role of passenger, until the day came when he insisted on walking. At first that seemed like a win-win. He could walk and I wouldn’t have to pull the wagon. I decided one of our first excursions would be to the park about a block from our house. The excursion would fit perfectly in the after lunch, before nap slot—five minutes there, about a half hour of playtime, five minutes back. No agenda, just playtime. We sunscreened up and trotted out the door. Christopher was so excited to be in the lead that he made up a song about going to the park. Wish I’d had a video camera with me (partly so I could share it with you, but mostly so I could use it to blackmail him if the need arises later in life). So, he’s singing “Park, park, PARK, park, PARK!” and then he stops at the end of our yard and climbs on a big rock, jumps off, climbs back up, repeat. I lure him off the rock, remind him of our destination, and we’re off again, singing. In some regards the afternoon was a wash. We never did reach the park. Naptime was very late and only accomplished by allowing Ribbit to sleep in a bowl by Christopher’s bed. But when I really think about it, this trip was the most worthwhile one we’d taken so far. So what if we didn’t swing at the park? Christopher had changed the purpose of our trip, and in so doing, had gained a pet, a new friend, and several dozen spiky seed pods. But the real treasure was the sparkle in Christopher’s eyes the next day as he asked me if we could go on another walk. Title: It’s Raining! It’s Pouring! We’re Exploring! Celebrates the joy of imaginative play as three bored children face a rainy day. Fun rhyming text, playful pictures. Love that Dad and Mom work together making lunch! What child doesn’t like to play with an empty box? Especially if the box is big enough to climb in! Inspired by the author’s memories of sitting in a box as a child, this book explores the power of imagination as a child transforms his ordinary box into a spaceship and flies to another planet. Although the point of my blog post is that kids need times to direct their own play, a parent can only take hearing “I’m bored” so many times before they cave in. Instead of turning on the TV, try some of the activities in these books. *You can read more about Kathy here. Kathy normally blogs on the second Monday of the month. Except when the months go by so quickly that I accidentally schedule her post for August instead of July and don’t notice until she politely asks where the post might have gone. In case you were wondering. Did you notice it’s an election year? Check out my book list and activity ideas over at ParentMap. The Wizard of Why is loving the reading right now. It’s so cute. He gets so excited when he sees a word on the street that he knows. He loves asking me “why does that say —-” and then getting my crazy reaction of “WHAT!? You can read that? !” He’s a long way from reading his own books, but the process is so amazingly fun to watch. And just thinking about the whole world that opens up when you start to be able to read…I’m just so excited for him! I found this book at the library recently and we loved it. It’s definitely for a slightly older crowd (I believe it was written with spelling, not reading in mind), but since he’s into looking at words right now it was perfect for him. 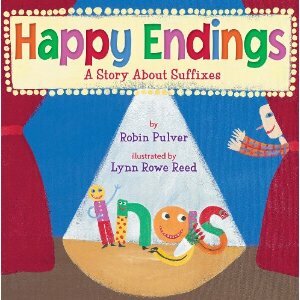 It emphasizes suffixes, word endings, which you wouldn’t think made for a fun book, but it does. The story is fun: a class of kids are about to go for summer vacation but first they need to complete the last lesson of the year on suffixes. This proves more difficult when the suffixes hear the teacher say the class is going to “tackle” them after lunch and they go into hiding. I highly recommend this book for kids learning to read and older kids learning to spell! Everyone else has WAY cooler blog names for their family than I do. 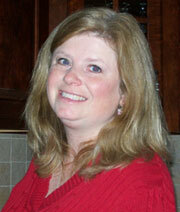 Ironic Mom Leanne Shirtliffe calls her twins Thing 1 and Thing 2. Kathryn Apel, children’s writer and author of This is the Mud, interviews a young writer named Squashed Cupcake. And Chase McFadden blogs at Some Species Eat Their Young while referring to his four children as Slim, Perpetual Motion, The Hellcat, and Tax Break #4. After a lot of brainstorming with my husband, I’d like to introduce my family. Although it’s only fair to note that my husband did NOT agree to his own nickname. Tough luck on that one. Well, I think there was more, but you get the picture. Plus, to say we are obsessed with the Wizard of Oz is a huge understatement. We are coming up on the one year anniversary of that obsession, so that will be a good 25% of his life. So that’s the reasoning behind that one. Gyroscope: Gyroscope, who is almost one, hasn’t stopped moving since he entered our lives, which he did as quickly as he does everything else (a mere 3 hours after announcing his intentions and a short 30 minutes after we crawled (he and I, that is) into the hospital). Favorite activities include: playing with anything the The Wizard of Why is currently playing with, crawling on the dining room table, standing on his head in a downward dog position. So–even if you don’t have a blog, what would be your blog names for your family? I don’t remember my first day of kindergarten. I remember second grade, when I met the principal for the first time and I wrote my age (7) backwards. I had to ask for an eraser because my pencil didn’t have one and I was mortified, but he didn’t strike me dead with a lightening bolt so everything turned out okay. This book is about the first day of kindergarten, but it’s a great read for any kid at almost any point in the school year. Ages: Perfect for 3 and up, or anyone going to preschool, kindergarten, summer camp, or anything else! She lives with her grandfather, and I think books with non-traditional family structures are really important to show kids. She’s spunky and wonderful and afraid of her first day at school. Her grandfather fixes everything with duct tape, polka-dot bandages, and runny soap. He gives her a mini fix-it kit with all three of these things to take to kindergarten and she uses all of them. The runny soap doesn’t fix the mess she makes with the paints, and the bandages don’t help when she’s really sad, but the duct tape does help an enemy turn into a friend, and it saves the day, as duct tape always should. What about you? Any memories, good or bad, from your early school days? And any ideas for a back-to-school kit? where’s the girl stuff at the science museum? Writing about girls and science and stereotypes and all that is wrong with the world at ParentMap. “Look, look at that one!” my son screams from the back seat. “And that one. It’s Very, Very, Very beautiful!” There is nothing my son loves more than the fall colors on the trees, and nothing could make me smile more than to hear him wax on about their beauty. Introducing my children to the world they live in is something truly important to me, and it’s something that can be too often overlooked. In addition to instilling an appreciation for nature in my children, it’s also important for me to bring nature into the home. Right now, I’m on somewhat of a crusade to buy natural items. I consider it an important part of creating a healthy home. Alway in the back of my mind are two things: a responsibility for the planet that seems to have been ingrained in me since growing up in the 90s (when people cared about such things) and the memory of my mother dying way too young from a disease about which we know way too little. I remember the oncologist telling her she couldn’t have conventional strawberries anymore and she should try to eat organic as much as possible. I think about that conversation almost every time I’m at the grocery store, wondering if the $3/pound apples are really worth spending the entire paycheck on. These two thoughts are always with me and since having kids they’ve been percolating, growing, until my desire to buy natural has become somewhat of an obsession. For example, my kids don’t have a lunch box without at least an hour on the internet trying to find the safest material to transport food. Those plastic cups he used to like to drink from? Sorry, they had BPA; they are gone. And the other ones, without BPA? I’m just going to stay a step ahead of the research this time and get rid of them, too…what are the odds that there is a kind of plastic that is actually healthy for us? No new purchase is safe from scrutiny: I recently spent probably no less than five hours researching puppet houses and puppets as a present for the kids from their great grandmother. It’s frustrating to me that I can’t find out exactly what things are made of. I finally chose one theatre because I saw a reference to “environmentally-friendly wood” and “non-toxic” paint, although I have no idea what either of those things mean. I found some wool and felt puppets to go with it. Which is why I loved finding this book at a country store in Mazama, Washington. I grabbed it immediately and flipped through it, but I knew I was going to buy it before I even opened the pages. I’ve already read it more than once. I’ve made the strawberry muffin recipe and purchased the ingredients to make my own lotion. The book is a great reminder that you don’t need to buy all the stuff you think you need. There are so many alternatives for making better, simpler, and cheaper options at home. Chemicals, be damned. I will be a natural mom if it kills all of us. And my husband thinks it might. Summary and Review: This book is part how-to guide, part story of a family, part annotated calendar of a wonderful year. Co-written by the mother and father of a family with four (now five if you read their blog) children, they talk about the beautifully natural ways in which they celebrate the seasons, living outdoors and in concert with nature as much as they can. The book itself is a wonderful celebration of the importance of family and the world in which we raise our families. While there are specific recipes and craft ideas, I found it to be more inspiration than resource. I have no doubt that if you read this book you may get something entirely different out of it. Maybe it will inspire you to sew or knit. Or maybe it will just make you smile and appreciate how good the simplicity of life with children can be.